Vodice is an old settlement with a rich history. In the town of Vodice and its sorrounding you can find a lot of historical places and buildings worth visiting. The Roman settlements like Velika Mrdakovica Arauzona or Roman Prižba on Srima peninsula can be reached by walking or with the bike. A great number of famous small churches with very interesting architecture are gathered in and around Vodice. The small island Prvic is of course the place that should be visited. This small Gothic church was built in 1402 and was dedicated to St. Cross in 1421. 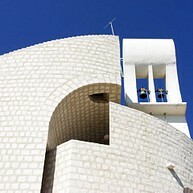 The church is built in the Gothic style, is a typical example of the rural sacral architecture. A valuable detail is the old Romanesque-Gothic holy-water font on the pillar, a unique specimen in this part of Dalmatia. 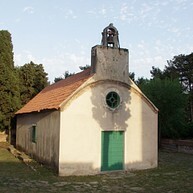 The church was built 1725 by Ivan Skok, a famous master of the Dalmatian Baroque. The chapel has a big altar, harmonius façade with a Baroque portal and a magnificent rosette. The side walls have oval Baroque windows. A famous painter of decorative frescos Eugenio Moretti Varese is the author of the altarpieces. The church was consecrated in 1760. Vodice was developed next to the water springs. On the square, under the parish church, there used to be two wells around which the whole rural life was developed. From the upper well (closer to the parish church) drinkable water was taken, and the lower well contained water of less quality which was used for washing laundry and other household needs. 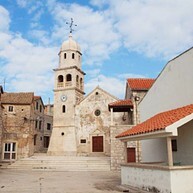 The tower is a unique example of a fortified tower that dates back to 1533 when Hyeronimus Saracenis concluded an agreement with Ivan, a stone-mason from Hvar, to begin construction. The initials H S, which stand for Hieronymus Saracenis, are inscribed on the coat of arms that is displayed on the eastern wall. The tower frequently changed ownership and at one time in the 17th century it was in the possession of the Fondra noble family from Šibenik that used the tower as their place of residence. Rakitnica settlemnt was mentioned in 1311 and today are still discerned the remains of the former houses and walls built in a dry-wall. A local church of St. John the Baptist, located close to the village, was built in 1445 when the parish of Rakitnica was founded. 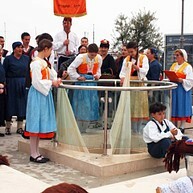 Masses are held twice a year, on the holidays of St. John the Baptist. St. Mary’s church of Our Lady of Mercy is a small and interesting church situated in Prvić Luka on a small island Prvić across Vodice. The construction of St. Mary’s church with a monastery beganAfter the Glagolic friars had been settled in in 1461 . 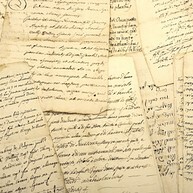 It is not known when it was finished, but we know that in 1479 building works were still in progress. The island Prvic, with its two villages, Prvić Luka and Šepurina which are connected by a road, was inhabited in 11th century from people who run away from Turks. The land on Prvić island was mostly owned by noble families from Šibenik that build country houses on the island. Among them mong is also the mansion of the famous Vrančić family. 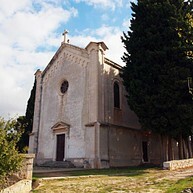 In the centre of Šepurina, near the coast, there is The Church of St. Rocco or St. Helen built and consecrated in 1620. Inside the church, there is a wooden altar of St. Rocco, richly embellished with Baroque ornaments. 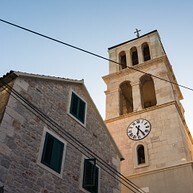 The Church of Our Lady’s Childbirth was built in 1479 and was raised by the Ambrozović fa­mily from Šibenik. It was expanded and renovated in 1878. There is one altar in the church, and there is a well in front of the church. The church is not in function nowadays. 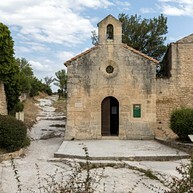 The Church of Assumption of the Virgin Mary was built in 1878 on the hill above the village. At the main facade there is an inscription: Hoc templum aedifigatum A. D. 1878. The church was restored twice, in 1898 and in 1938. By the excavations 1969-1976 the arceologists found two roman one-nave basilicas built in different times. They re called basilicae geminatae or “the twin churches” and their purpose is not clear. 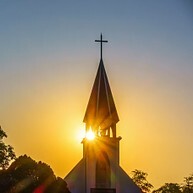 One idea is that the basilicae geminatae are a conjunction of the congregational churches that serve for the public worship mass and memorial ones intended for the cult of relics. At the Faust Vrančić Memorial Centre, you can get to know the life and work of Faust Vrančić, a man whom the world today mostly remembers as the inventor of Homo Volans - the flying man, but he was a lot more... Take a look at the collection of the models of his inventions, some of which are real life size, and his more important written works. The multimedia displays also provide educational games for the youngest visitors. 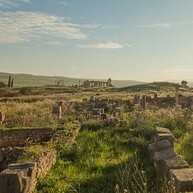 On this rich archaeological site from the pre-Roman and Roman times about a hundred tombs have been discovered, out of which some date back from the 4th century B.C. According to the found artefacts and records of the Roman writers, experts identify this settlement as Arausona, a Liburnian-Roman settlement mentioned by Pliny. Tombs of the older layers of necropolis date back from the 3rd to the 1st century B.C., and they were made under the Hellenistic influence. A complex of blocks of hauses made of fine carpented stone, joined with clay, and later with mortar was also found here. The settlement was surrounded by defensive walls, made from the fractal stone, and was divided by streets. Some buildings had water tanks incised into the bedrock for collecting the rain-water. Nearby Arauzona there is still a natural catchment, coved in Roman times, which domestic people today call Roman cistern and which served for the water supply of the local inhabitants, while the livestock watered in a puddle in the field, north of the settlement. We believe the picture in your mind when you are imagining a Dalmatian town is that of Sepurine. Beautiful, quiet, old, noble, stealing breath in front of every house. Solid, stone, steep streets, stone houses, each capturing attention with its particularity, still forming a harmonious, single whole story. It is a story of glitter and wealth that used to be, and laughter that once resounded along these streets. Population of Sepurine used to be greater than that of Vodice. Today unfortunately, it shares the destiny of all the places on the island. Prvic, with its two settlements, Sepurine and Prvic Luka, was first mentioned in the 11th century. It was substantially inhabited by people from Srima and Vodice who fled here in fear of Turks. In the 16th century, the island became a fashionable resort for Sibenik nobility, building their villas and summer residences on it.